Bearings are eventually going to wear out. They are designed to take the brunt of the wear that would destroy more expensive components such as shafts and gears. That’s why it’s always a good idea to replace your bearings if there is any question about how much life they have left or if they might be damaged. Engineers can do a pretty good job of estimating how much expected life a bearing has based on loadings, environment, speeds involved, and type of lubricant used. If the manufacturer suggests that the bearings need to be replaced after a certain number of hours of service, you would be wise to pay attention. For bearings to function correctly, they need some type of lubrication. 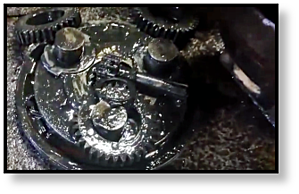 One of the major causes of bearing failure in just about any kind of machine is going to be insufficient lubrication. Some of the bearings in your final drive motor will be exposed to hydraulic fluid which also serves as a lubricant. Other bearings, such as those in the planetary side of your final drive motor, are lubricated by gear oil. In some final drives, the lubrication for the main bearing is separate from that used by the rest of the hydraulic motor and requires a special type of oil. If bearings do not have enough lubrication, bad things are going to happen. They will experience an increase in friction, which leads to the generation of heat which in turn leads to more friction -- a devastating cycle of damage that can destroy your bearings. Lack of lubrication also prevents the conduction of generated heat away from the bearings, which makes things even worse. And keep in mind that lack of lubrication doesn’t just mean that you don’t have enough lubricant. Old, degraded oil that has been reduced to a smelly sludge isn’t going to do an adequate job of lubricating your bearings, either. 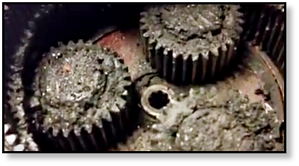 Another common cause of bearing failure in final drive motors is contamination of the lubricant. Contaminants can take many forms: tiny specks of silt, microscopic slivers of metal, small flakes of rust, a single thread from a cleaning rag, a few drops of water -- all of these would be considered contamination. Basically, contamination is anything in your lubricant that isn't supposed to be there. Contaminants prevent the oil from effectively doing its job, which leads to premature bearing failure. If your lubricant looks like sludge, has the texture of pudding, or is filled with grit then it is doing far more harm than it is good. Incorrect installation will also lead to premature bearing failure. Misalignment, damage to the bearing surfaces, improper preload, insufficient or excessive tightness, and similar installation issues can cause a bearing to wear out long before it is supposed to. Bearing failure can almost always be traced back to one thing: lubrication. Make sure that your bearings stay lubricated, and that that lubrication -- whether it’s hydraulic fluid, bearing oil, or gear oil -- stays contamination free. 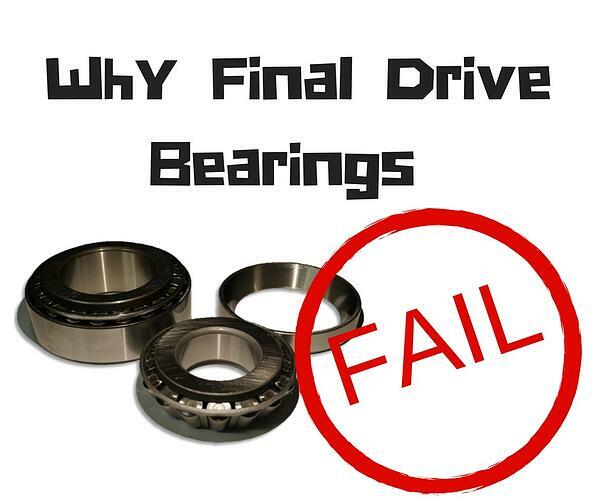 Your final drive bearings will be far more likely to live out their expected life, and you’ll save a great deal of money on repairs and downtime.